Good to have the custom size option.....saved me in a pinch. I will certainly use them again. Recommend this supplier to any artist who needs special sized frames. Love our frame! Great quality, packaged secure, and quick delivery. Will definitively use this company again for future framing needs. Cool stainless frame, it was just perfect for my night street painting. Debated a long time over the frames and cost. Was able to take advantage of an excellent sale and reduced S&H to make costs manageable. No equals exist in premade frames. Significant savings from even the “best sales” at name brand craft stores. Quality and workmanship exceed my expectations again. 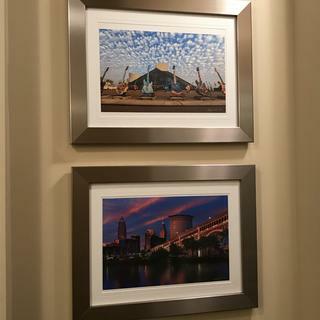 Photo prints look truly exquisite. Have purchased custom frames previously and will recommend to all. This was the 1st time ordering from PictureFrames.com and I was very happy with my purchase. I looked all over for poster size picture frames in brushed silver that would fit a matted photo. To my surprise, they arrived very quickly and very well packaged. Easy to assemble and hang. I would highly recommend PictureFrames.com for your framing needs. for my newly renovated kitchen wall. The deep rabbit accomodates my canvas painting. The sleek mid century modern look will go well in my bedroom. Makes my art look expensive and beautiful! Liked the thickness of the frame and the real steel finish. 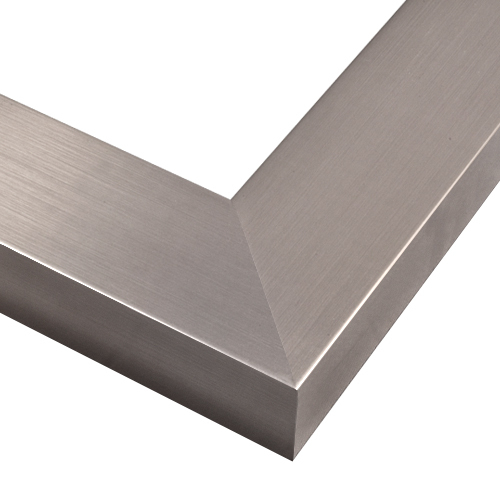 Great for a modern statement to any room where stainless works! Clean look, doesn’t distract from the art work. Wanted a wide stainless steel frame for a piece of art that will hang by 3D wall art of a suspension bridge, so the metals should compliment each other well. 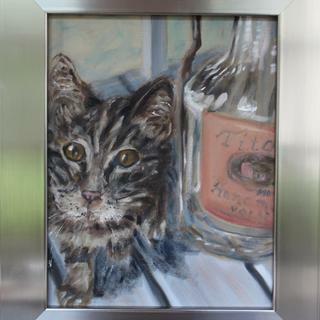 I wanted a was simple, contemporary frame to complement my charcoal drawing. Something different different from the classic black frame. Is this wood or stainless steel? the description has both so it is confusing. Thank you for your inquiry and we apologize for the confusion. This is an upcycled wood fiber frame that is covered by a laminate that looks and feels like steel. 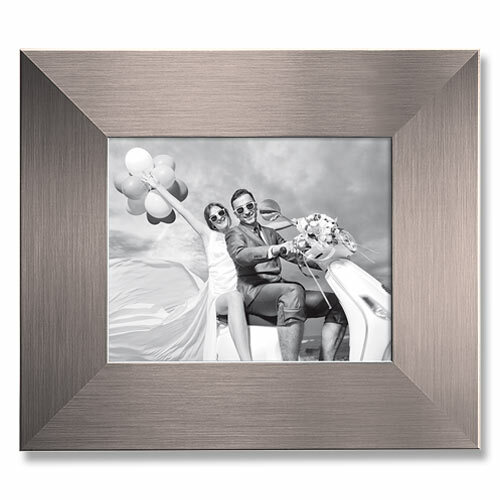 We recommend ordering a free 3" sample of the frame. That way you will be able to see and feel what the final product would look like. If you have any additional question do not hesitate to contact our friendly framing experts at 1-800-332-8884. It is both. Think stainless veneer on top of composite wood. It is very stunning, it added the perfect drama to the artwork that was framed. I hope this helps. It is both. Made from wood with a stainless steel overlay. I’ve purchased 4 of these frames and am very pleased with the product and look. This frame is wood with a metallic looking finish. I used it as a mirror frame and marches nicely with the brushed nickel fixtures. I need a frame 92"3/4 w 71" H can you guys make this size ? BEST ANSWER: Yes, we can make a GO6 frame in size 92.75"x71". You will need to call us to process the order over the phone. We can be reached at 1-800-332-8444. Why does this not say its wood in the description? BEST ANSWER: Thank you for your observation. We will update our description to show this is a wood frame. Sorry for any confusion this may have caused.